With the state of the current economy there has been a knock on effect within many areas of society not least within the building trade. In the past it has been the normal progression for a couple to start their life together in a modest sized home, with a plan to move to a larger property once the children begin to appear. The availability of affordable homes up for sale has decreased dramatically being 40% below levels before the credit crunch. This is the case countrywide from places like Essex and Kent to locations further north such as Wigan and Manchester. This factor only adds to the existing stresses of moving house prompting many people to decide to stay put. This situation can also bring complications as families continue to grow despite the lack of available space. 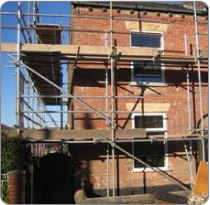 One solution is becoming increasingly popular and that is to build onto or extend the existing property. Extensions while easing any overcrowding issues can also add substantial value to a building, bringing a bonus when it is eventually on the market. Extensions come in several forms such as sun-rooms, conservatories, orangeries or any extra room. Another option which is frequently seen is loft, cellar or other kinds of conversions. Abandoned or neglected spaces can be transformed into extra bedrooms, bathrooms, work rooms, studios, playrooms and any number of other useful rooms. When choosing a builder to carry out your extension or conversion it is wise to find a reputable company and one which can deliver a comprehensive service. SJP Builders Wigan offer a full range of services and can manage all projects from start to finish. SJP cover every aspect within the building arena including planning, house extensions and refurbishment, plastering, roofing, joinery, kitchen and bathroom fitting, decking and double glazing. SJP Builders Wigan are members of the Guild of Master Craftsmen who provide an additional guarantee for customers peace of mind. The SJP Builders Wigan website also has an interesting page of testimonials from past customers.